Steam drum level control is necessary to add makeup water as steam is delivered into the header and to the associated process equipment. The system should control the drum level at a specific set point while compensating for varying steam demands and drum pressures. For a given volume of steam and blowdown leaving the steam drum, an equal amount of water should replace that inventory. Discussions here include the primary sensing devices and the various strategies used to control steam drum level and feedwater rate. The YS1700 Dual Loop Programmable Loop Controller can perform any of these strategies. Multiple analog/discrete inputs and outputs allow maximum versatility within one control device. The drum level is measured using a differential pressure transmitter. Refer to the drawing on the right. The output of the instrument increases as the differential pressure decreases. A typical range is 30 inches of water column. A condensing reservoir is installed to allow the high side of the D/P to measure the steam pressure plus the hydraulic pressure in the reference leg. The low pressure side senses the boiler drum pressure, the weight of the water above the low pressure tap and the weight of a column of saturated steam from the high pressure tap to the water level. Being a differential pressure device, the boiler drum pressure is canceled out of the measurement, leaving only the water column pressure difference. The level measurement is accurate only at a single drum pressure. If needed, a pressure measurement can compensate for varying drum pressures by applying a gain and bias to the drum level signal. Under steady-state conditions, both water and steam bubbles reside below the water surface. The average mixture density is constant. Should steam demand increase, the steam bubbles expand under the water surface, increasing the average mixture density. This causes an increase in steam drum level without the addition of feedwater. This increase in level proportional to an increased steaming rate and decreased drum pressure is called swell. Inversely, as the steam load decreases, the steam bubbles in the steam/water mixture decrease in size and volume. This causes a decrease in drum level, although the mass of water and steam has not changed. This phenomenon is called shrink. These apparent changes in drum level can be compensated for by implementing a pressure transmitter and drum pressure correction factors as a part of the feedwater control strategy. The YS1700 controller can accept this input and provide the necessary corrections. These natural occurrences are not preventable, but a properly designed control system can minimize the adverse effects. A single element control strategy uses the drum level signal as the process variable. 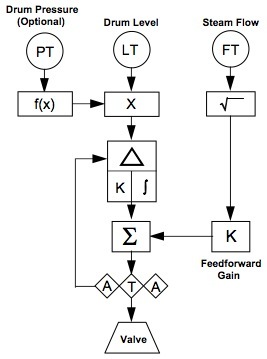 After performing a P+I computation on the level deviation from set point, the output of the controller is sent to the feedwater flow control valve. This configuration is used on small boilers with a relatively large water volume and steady loads. 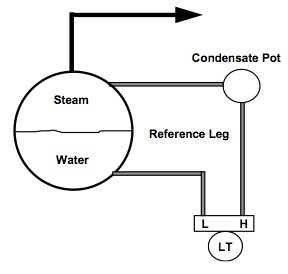 In addition to the drum level measurement, a two element design uses a steam flow transmitter as a feedforward input to the feedwater controller. This feedforward plus feedback configuration allows the controller to anticipate a need for additional feedwater flow before this is sensed as a lowered drum level. The steam flow signal is characterized for gain and applied to a summer modifying the level controller output. The SAMA diagram on the following page shows the two element configuration with an optional drum pressure input. This design is typically used on small to medium boilers with moderate changes in steam demand. The effects of shrinking and swelling are minimized in this design. However, a disadvantage is the lack of compensation for varying feedwater pressure. This problem is common in multi-boiler installations with a common feedwater system. These pressure variations change the material balance between steam flow and feedwater flow. If variable feedwater pressure is a problem, a three element control configuration can correct the difficulty. In addition to adding a feedwater flow input, two P+I controls are used in a cascade configuration. Refer to the SAMA drawing at the right. The computed output of the level controller is software linked to the remote set point of the feedwater controller. The slow reacting level control is usually tuned with a moderate proportional band setting and a long integral time. As with two element control, the steam flow measurement is used as a feedforward input to anticipate steam demand changes. Adding the fast acting feedwater controller allow quicker reactions to load changes. Feedwater pressure variations do not adversely affect the control action, since the feedwater flowrate is metered. The YS1700 controller can be programmed to perform three element control with optional pressure compensation, all in one instrument. Up to five analog inputs and three analog outputs are available. Up to six discrete inputs/outputs is standard. 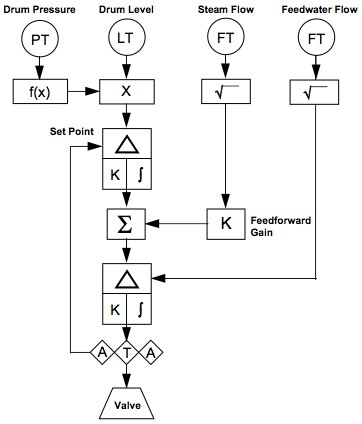 The cascade control strategy is a standard arrangement that can be easily implemented. The YS1700 Dual Loop Controller has a high resolution backlit LCD display with LOOP and TREND screens. Of special interest is the TREND display, allowing operator to observe the level and feedwater rates over a selectable time base. The YS1700 Dual Loop Programmable Controller is a cost effective means of implementing any of the boiler feedwater control strategies discussed here. The multiple input/output capability, math and characterization functions and dual P+I+D computation ability allow maximum versatility. An optional digital communications card permits YS1700 controllers to be integrated into a PC-based boiler control system. Third party Windows-based graphical software packages are available to allow the boiler operator access to the YS1700 control modes and all operations can be performed from the PC. The YS170 Single-loop Programmable Controller was discontinued on 1/01/2008. The YS1000 Series is a replacement product.